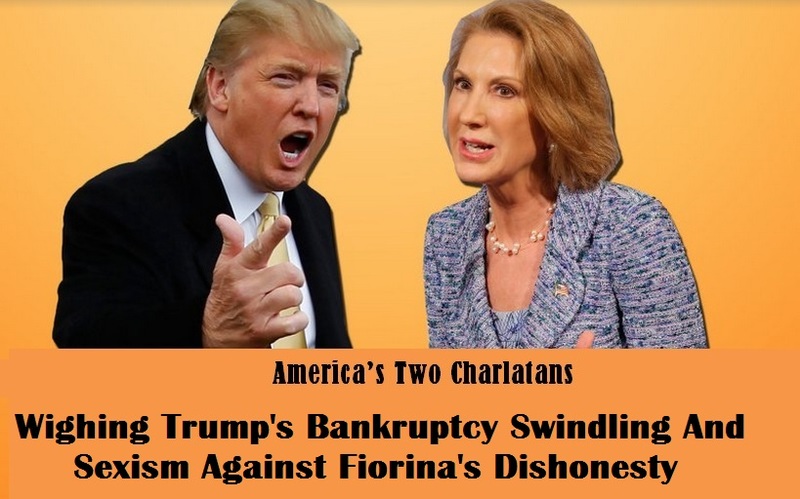 Weighing Trump’s Bankruptcy Swindling And Sexism Against Carly Fiorina Dishonesty; Lost Causes For America! One part of me wants to bash Carly Fiorina for her persistent dishonesty. The other part wants to defend her against Donald Trump’s persistent sexism. So here’s both. Horrific, but untrue. The sting video, released by an anti-abortion group, features a former technician for a fetal tissue procurement company describing how a Planned Parenthood employee “taps the heart and it starts beating,” then instructs her to remove the brain. As Factcheck.org concluded, “The video does contain images of what appear to be intact fetuses, but they don’t fit Fiorina’s description.” One clip, in which a fetus appears to move, is credited to a different anti-abortion group, and it’s unclear where it was filmed. Another shows a stillborn baby, it turns out, not an aborted fetus. Fiorina’s comments could be chalked up to forgivable hyperbole, easily remedied. The audio from the technician is gruesome enough, and Fiorina could be excused for thinking, as the video’s producers presumably intended, that she was actually watching the scene being described. But backing down is not the Fiorina way. Repeatedly challenged after the debate, she repeatedly asserted that she was correct and that any disagreement was lazy partisanship from critics who hadn’t bothered to watch. This dishonesty is part of a pattern. Fiorina’s up-by-the-bootstraps foundational story — from secretary to chief executive — is similarly misleading. In fact, Fiorina is the child of privilege. Her father was a Stanford law professor, Duke Law School dean, deputy attorney general and federal appeals court judge. Horatio Alger this is not. Even when he is backpedaling, Trump can only do it condescendingly, in terms of appearance. “I think she’s got a beautiful face, and I think she’s a beautiful woman,” Trump said at the debate. Dig, Donald, dig. And even when he’s not commenting on appearance, Trump’s criticism of Fiorina is laced with not-so-subtle sexism. “She’s got a good pitter-patter,” Trump told Stephanopoulos, “but if you listen to her for more than five minutes straight, you get a headache.” He used the same dismissive line on “Fox & Friends” the next day. Not that Trump’s fellow candidates are paragons of gender-neutral virtue. How revealing that Mike Huckabee picked his wife and Ben Carson his mother as candidates for the $10 bill. Really, women are only valued as wives and mothers? They can’t think of a woman — an American woman, Jeb Bush, not Margaret Thatcher — with accomplishments besides marriage and procreation? What if a female candidate selected her husband or father to be featured on the national currency? Fiorina rejected the premise as mere “gesture,” arguing that “we ought to recognize that women are not a special interest group.” But currency is inherently symbolic; including a woman is about equal, not special, treatment. Fiorina’s response lets her appear above the fray of gender politics, even as she benefits from being the only woman in the GOP race and touts her ability to take on Hillary Clinton. GOP presidential candidate Carly Fiorina likes to portray herself as a hard-liner on Iran. However, during Fiornia’s six-year tenure at Hewlett-Packard between 1999 and 2005, the company sold more than $100 million worth of computers and other high-tech equipment to Iranian customers, despite US export sanctions at the time. It’s a small detail she has neglected to mention while on the campaign trail. How did HP do it? The usual corporate schemes: the products were channeled through one of HP’s European subsidiaries, and sold through an IT distributor in Dubai, known as Reddington Gulf. The sales continued long after HP sacked Fiorina. By 2007, more than 40% of printers sold in Iran bore the HP trademark. HP had started skirting Iran sanctions in 1997, two years before Fiorina came on board. By that time, sanctions imposed by the Clinton Administration had been in place for two years. However, there was a loophole in the law that allowed HP to do business in Iran “legally,” albeit indirectly. Under the rules in place at the time, foreign subsidiaries of American companies were considered outside of US jurisdiction. Nonetheless, the issue came to the attention of the Securities and Exchange Commission in 2009 because of concerns that the equipment might be used for military or terrorism-related purposes. HP’s legal department claimed that, because the subsidiaries were not “United States [corporate] person(s),” they were not subject to US sales restrictions. During the first GOP debate, Fiorina declared that on her first day in office she would call Iranian leader Ali Khameni with the following message: “Until you open every nuclear and every military facility to full, open, anytime/anywhere inspections, we are going to make it as difficult as possible for you to move money around.” As CEO of Hewlett-Packard, however, Fiorina had no problem with Iran moving money into her own company’s coffers. It reminds us of another American businessman-turned Republican politician who got wealthy doing business with a government hostile toward the US. His name was Prescott Bush – and the country in which he was doing business was Nazi Germany.